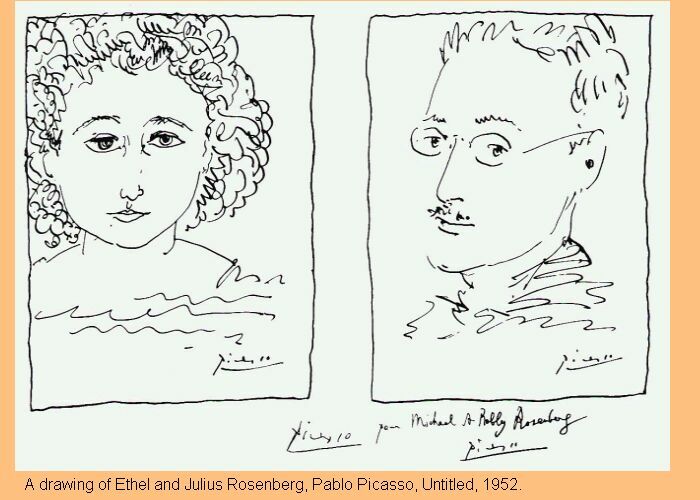 Drawings of Ethel and Julius Rosenberg by Pablo Picasso, 1952. 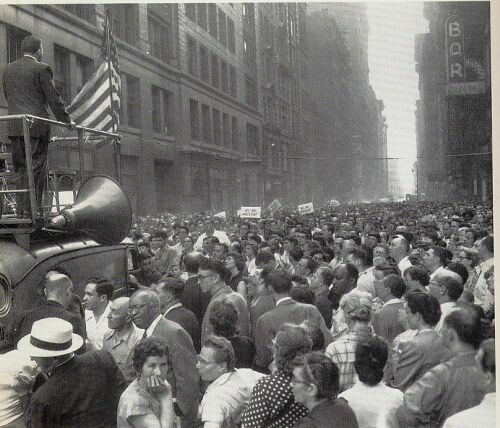 June 19, 1953 is a never-to-be forgotten date in American history. 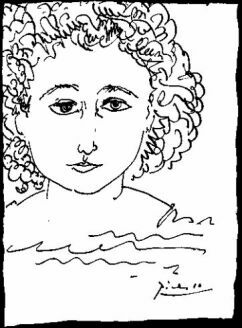 On that day Julius and Ethel Rosenberg died in Sing Sing’s electric chair on the frame-up charge of conspiring to commit espionage for the Soviet Union, orphaning their two sons, 6-year old Robby and 10-year old Michael. 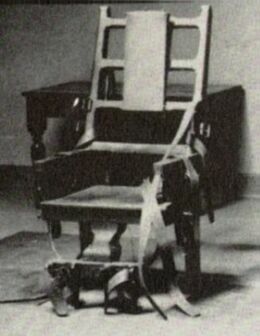 The Rosenberg case was unprecedented in the way the death penalty was applied. Never before in American civil court history had there been an execution for espionage, let alone conspiring to commit espionage. And since then, many Americans have been convicted of spying for the Soviet Union and other countries. Amazingly, some of these spies were FBI and CIA agents. Yet, none of them have received a death sentence. What made the Rosenberg case so unique? The defendants were executed for crimes they were convicted of in the media, but not by a jury in the courtroom. The trial took place at the height of McCarthyism and anti-communist hysteria and paranoia. 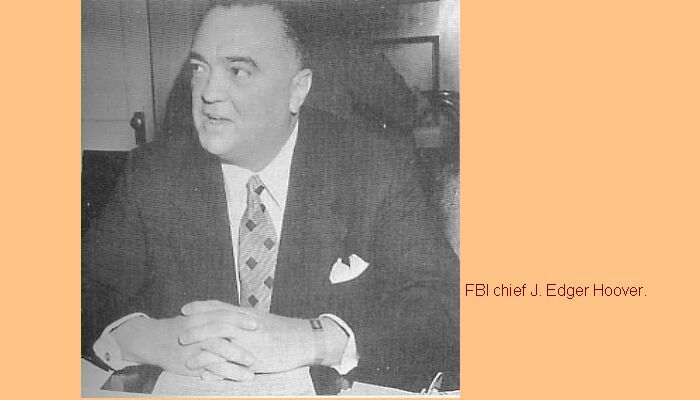 For eight months after their arrests, the Rosenbergs were being blamed by the FBI and throughout the media with having caused the United States’ undeclared war then raging in Korea. It was claimed that they did this by having stolen and transmitted the A-bomb secret to the Soviets. A majority of Americans uncritically accepted these false allegations and clamored for the harsh punishment of these “communist traitors”. When the trial began the public was under the impression that the defendants were being tried for atomic espionage and treason, a capital offense. However, neither of these crimes was charged at the trial. The indictment was only for conspiring to commit espionage, not for passing any classified material. And definitely not for treason. The press and the public could have no idea of what the real charges were, based upon the opening statement of chief prosecutor Irving Saypol: “The evidence of the treasonable acts of these three defendants you will find overwhelming . . .” And Judge Kaufman, in his sentencing statement, delivered seven days after the trial ended, justified the death penalty by saying that the Rosenbergs “put the A-bomb into the hands of the Russians”, were guilty of causing the war in Korea and “treason”. The wrongful charges made in the media were perpetuated both during and after the trial. This explains the acceptance by Americans of the outrageous sentences imposed in this case. 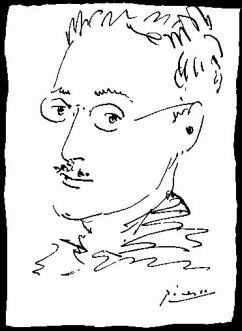 Even to this day the Rosenbergs are mistakenly thought of by most Americans to be “atom spies” who were convicted of treason. Thus, two shocking precedents were set. The first is that people can be sentenced to death for crimes for which they did not have a trial. The second is the denial of the right of confrontation. Defendants must be apprised of the charges against them and afforded the opportunity to reply in a court of law. This is a right guaranteed in all democracies. There were many violations of law in addition to those mentioned above. These occurred before, during and after the trial. Tragically, these miscarriages of justice even spread to the United States Supreme Court, the highest court in our land, from which there was no legal recourse. The purpose, and result, of this frame-up case was the destruction of America’s political conscience. The harsh sentences meted out in this case conveyed a clear message to Americans that disagreement with our government’s policies could be hazardous to liberty and life. In addition, the outcome of the case reflected and re-enforced one of the most draconian laws (passed over the veto of President Truman) ever enacted by Congress: The Internal Security Act of 1950 (McCarran Act). 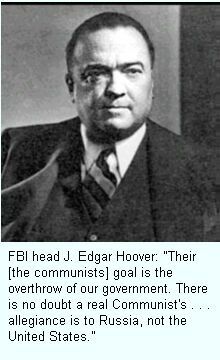 By order of this McCarthy/FBI inspired McCarran Act, all members of the Communist Party and all members of a hundred so-called Communist Front organizations (defined by the Attorney General), were declared to have “transferred their allegiance to” the Soviet Union. Overnight, almost 500,000 Americans had become “Soviet spies”. 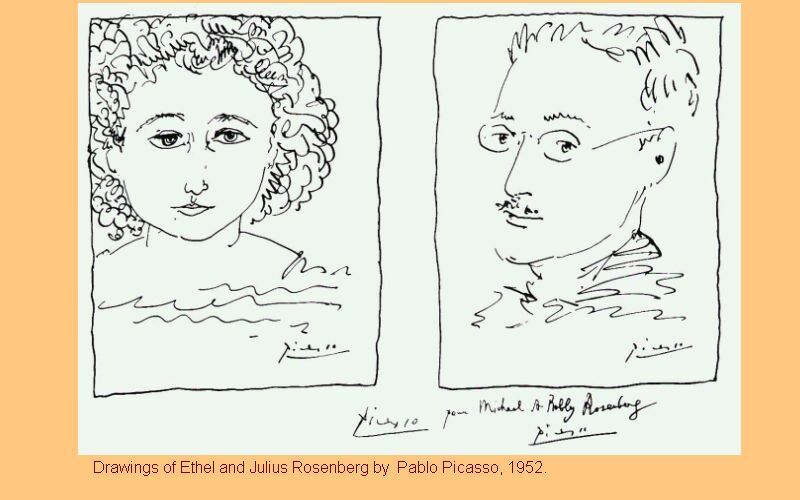 Of course, this included the Rosenbergs. Because of the stigma attached to membership, many public service organizations were destroyed. These organizations had defended civil rights and civil liberties; supported affirmative action; and aided the poor, the minorities, the under-privileged, the unemployed, the elderly and disabled, the ill housed and ill fed. Although most of the McCarran Act was declared unconstitutional and repealed by 1971, progressive party politics has been stifled to this day. Unfortunately, another impact of the McCarran Act was also felt almost immediately in the courtroom. Judge Kaufman not only used this legislation as a guideline for jury selection, but actually went beyond the scope of the Act for his criteria of what would make one unfit for jury duty. Firstly, he extended the list of “un-American” organizations beyond that defined by the Justice Department. He further declared that friends and family of anyone in these organizations and former members were also to be excluded as jurors. Judge Kaufman’s broader application of the McCarran Act meant that millions of additional Americans were suddenly tainted. Letter from Julius to Michael and Robert, October 23, 1952. McCarthyism in the 1950’s reproduced the Salem Witch Trials of the 1690’s. It happened right here in the United States, and it can happen again. Protect your rights! Help us to reopen the Rosenberg case. Included on this site are numerous essays, documents, links, and a multimedia bibliography for detailed information about the trial, the people involved, the historical context in which the events occurred and what has happened since then. Also included are ways for you to actively become involved; sample letters and emails to send to your representatives and other government officials. We welcome your input, participation, and donations to further this cause. After the trial, “The Committee to Secure Justice in the Rosenberg Case” was formed. This committee was led by David and Emily Alman. After the executions, the same committee became “The Committee to Secure Justice for Morton Sobell“, a codefendant with the Rosenbergs. Sobell was also convicted of conspiracy to commit espionage and was sentenced to 30 years in jail. Approximately ten years later, the National Committee to Reopen the Rosenberg Case (NCRRC) was formed and has continuously been in existence ever since. Aaron Katz, a member of the original committee, served as director for 42 years, until his retirement in 2005. Its current president is David Alman. Tibby Brooks serves as executive director. The committee seeks to present the truth about the most important political trial of the 1950’s McCarthy era. 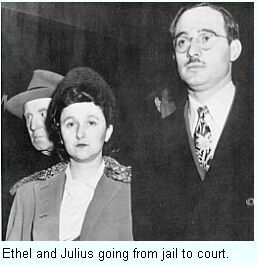 The Committee is committed to disseminating evidence showing that the prosecution of Julius and Ethel Rosenberg as master atomic spies was little more than a judicial charade. Moreover, in sentencing the Rosenbergs to die in the electric chair, officials and agencies of the U.S. government committed a grave injustice—and did so knowingly. The Committee’s ultimate goal is to win an official review of the Rosenberg case and exoneration of the Rosenbergs. 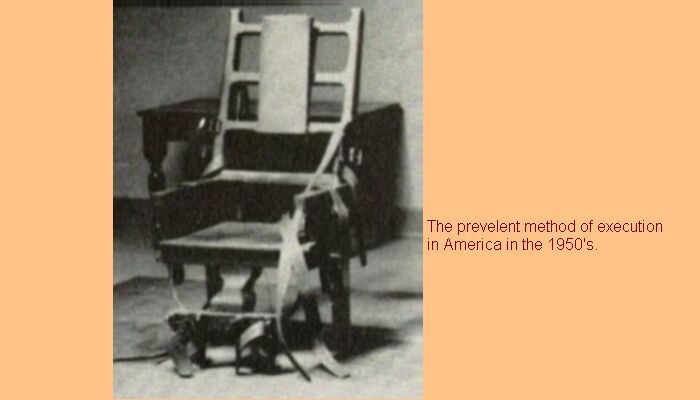 Although nothing can change the finality of the death penalty, an acknowledgment of government wrongdoing in this historic cause celebre would be a first step in halting the perversions of due process and human rights that continue to undermine our constitutional democracy today. The NCRRC also supports campaigns to redress the unjust incarceration and excessive punishment of prisoners; including the imposition of the death penalty on Mumia Abu-Jamal. The NCRRC deplores the dismal failure of our judicial system and calls for its review and reform. did not stop thousands of supporters from gathering in nearby Seventeenth Street. 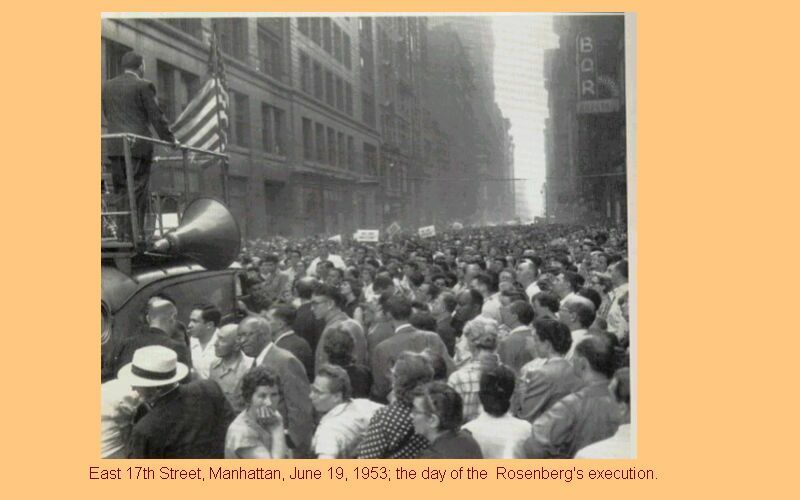 Each year, on or around June 19th, the date of the Rosenbergs’ executions, the NCRRC holds a memorial gathering. (Click here for information on this year’s program.) The Committee maintains a mailing list, issues newsletters, initiates and supports actions to achieve its purpose. Please join us in helping to create a stronger America with justice for all citizens regardless of race, religion, or political persuasion. When making a donation, please fill out this FORM so that we can keep in touch. 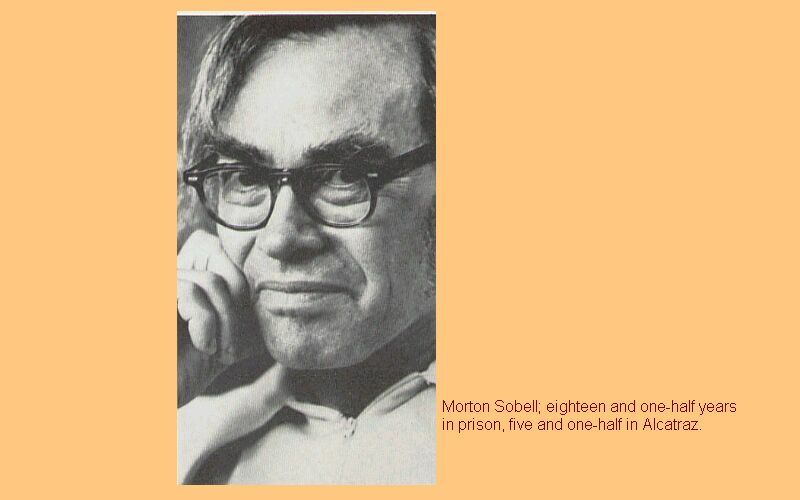 Morton Sobell, heroic fighter and defender of Human Rights. Half a century ago, while defending his rights in the Rosenberg/Sobell case, Morton Sobell set a shining example of courage, integrity and principle for all Americans by fighting the McCarthyism and cold-war anti-communist hysteria and paranoia of that dark period. He paid a horrible price for his defense of truth and justice, serving over five years in America’s hell-hole, Alcatraz prison, and thirteen long years thereafter. But he returned unbroken, with his full mind, determined to continue his efforts for human rights and social justice. Most of the photos on this site can be clicked on and will then link to a related photo or to a larger version of the same photo.Copyright notice: wherever possible we have endeavored to contact the copyright owner and give credit for any material not originated by the committee. However, if in error we have not properly referenced material or included material under exclusive copyright, please notify us and we will correct any omissions or promptly remove the material. Website design Rob Goldman and Dan Hittner. Please contact us regarding lost links, difficulty in viewing, or any other design/technical matters related to this site.